Qld Guinea Pig Refuge Inc is a not for profit organisation, dedicated to helping mistreated, abused and unwanted guinea pigs in need. We are located at Bracken Ridge, North Brisbane. We hold our open days on the first and third Saturday of every month. At our open days, not only do we adopt guinea pigs to loving homes, we also sell guinea pig housing, food and hay, as well as a great range of accessories to cater for your guinea pig's every need. Qld Guinea Pig Refuge is located at Bracken Ridge, North Brisbane. 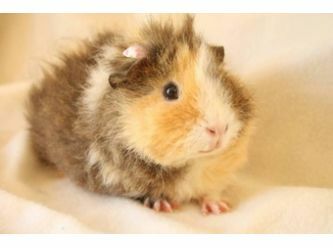 The adoption fee for our guinea pigs is $20 each. Desexed guinea pigs are $30 each. They come fully health checked; worm and mite treated; and have been living at their foster carer’s house where they receive handling time. 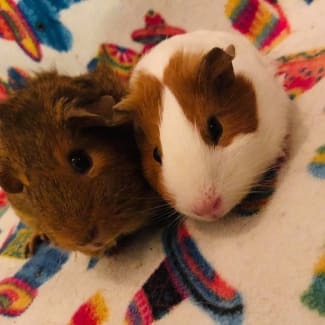 If you are interested in adopting these guinea pigs, please fill out the adoption form by following the link below. Ask us about our great prices on indoor and outdoor cages. Qld Guinea Pig Refuge is a guinea pig shelter dedicated to helping mistreated, abused, and unwanted guinea pigs in Queensland. To ensure they live a happy and healthy life, our guinea pigs are rehabilitated under our no euthanasia policy and then adopted under our strict adoption policy. To learn more about Qld Guinea Pig Refuge, and guinea pigs in general, check us out! This is Thelma and Louise (right). Two adorably fluffy 6 month old girls who are ready for the next stage of their lives - to find their forever home! Can you open up your hearts to them? As Louise has long hair she must go to an indoor home only. May I introduce you to Minnii (left) and Martha. These girls are 4 months old and 2 months old respectively and are full of life! A very cute and endearing couple who love to hide, run around their cage and come up to the cage door whenever they sense treats!! As Martha is under three months of age they will require an indoor only home, no C & C cage, and no ramps. They are NOT suitable for children under 12 years of age. 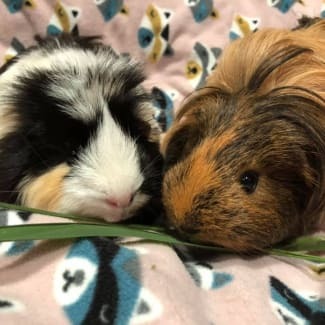 These piggies are a bonded pair and must be adopted together. Lamington (left) and Satay (right) are a super gorgeous pair of guinea pigs looking for their new home. Lamington is a 1.5 year old desexed male and Satay is a 1 year old female (not desexed). 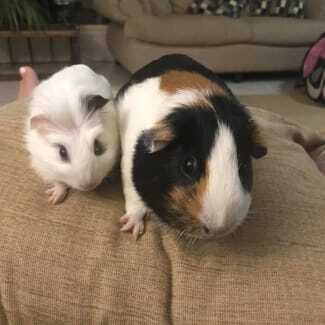 These two love to race around their cage and make a lot of noise at dinner time to get your attention, but also love to cuddle up on your lap. 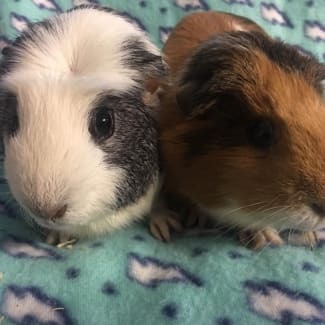 These guinea pigs are a bonded pair and must be adopted together. 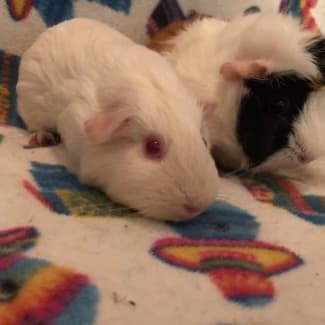 Meet Ayla(3year old desexed female) and Elio((6weeks old, male) These 2 adorable piggies are looking for their forever home. Ayla is a super calm and nurturing foster ‘mummy’ for Elio. She sits calm and quietly on your lap for cuddles. Elio is an energetic young boy, climbing, jumping and running all over the cage. He surely lets you know when he’s hungry, and squeaks when he hears the fridge door. Ayla and Elio is a bonded pair, and must be adopted together. As Elio is full of energy he must go to a home with No children under the age of 12, indoors with no ramps and are not suitable for C & C cages. Introducing Annabeth (left) and Athena - two 5 month old girls who deserve the best life. This pair are fairly timid and shy but once held in your arms, are contented. They are best suited to older children and adults. Can you give these a loving home and help them continue to grow their confidence? Annabeth and Athena are a bonded pair and must be adopted together.